Communication has reached the ultimate heights with innovation in media and telecommunications. For internet users, News portal has become an online communication medium. By following the news portals online, you can procure any recent information across the globe, which seems appealing to the viewers. But being the most sought after medium of communication for exchanging news, these news portals are facing challenges nowadays for displaying authentic and good content. 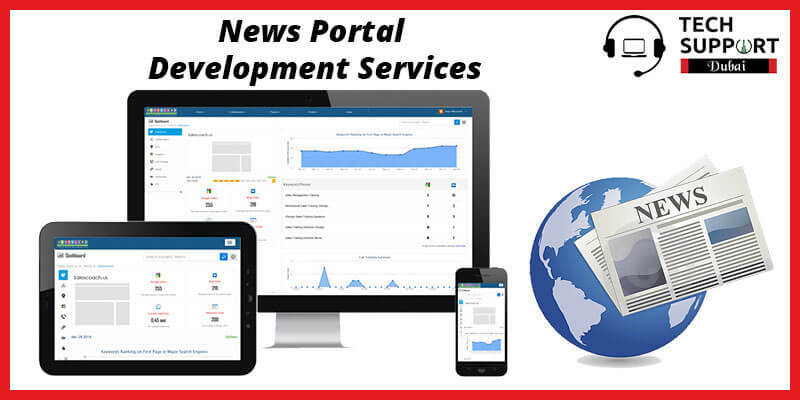 Thus, if you are planning to develop a user-friendly news website for potential readers, you can choose our News portal Development services. Our services allow publishing articles, blogs, news columns, press releases and other news related content. If you are looking for a competitive News Portal Website Development in Dubai, then you are in the right place. We have a team of developers who ensure to provide you the best news portal development in Dubai. They are glad to offer the clients a competitive news portal website by using different technologies like WordPress, Drupal, Joomla, etc. Being a trusted News portal Development Company in Dubai, our services make your work easier than ever before. Our developers promise to give you the exact result that you were looking for. Come in contact with us as soon as possible by calling us at our helpline number: 042053349 and have a detailed discussion with our experts to improve the responsiveness and performance of your news website. You can also chat with our executives through the live chat facility or contact us via email service. We also provide PPC services in Dubai.